Obscura has created what is hailed as the world’s largest permanent projection mapping display on Chicago’s theMART using 34 Christie Boxer 4K30 projectors to beam over 1 million lumens. Obscura, known for creating one of a kind immersive experiences, recently launched what is hailed as the world’s largest permanent projection mapping display on Chicago’s theMART, formerly known as the Merchandise Mart. 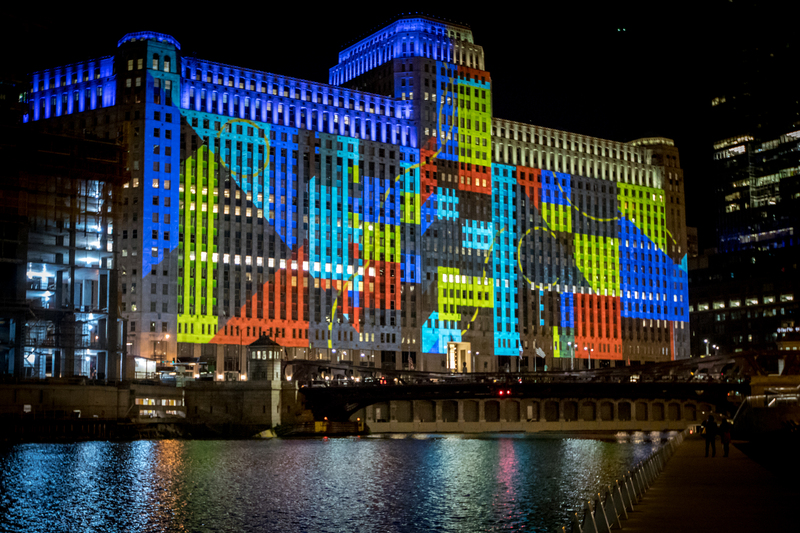 Titled ‘Art on theMART’, Obscura used 34 Christie Boxer 4K30 projectors to beam over 1 million lumens onto the 2.5 acre south façade of the iconic building. The Vornado Group, approached Obscura to create an attraction that would celebrate this rich heritage, as well as contribute to the ongoing revitalisation of the Chicago Riverwalk. With an impressive resume of large scale projection mapping projects including the Vatican and the Empire State building, Obscura was more than up to the task of projecting onto what was once the largest building in the world (with 4 million sqft of floor space and its own zip code until 2008). The Obscura team got right to work by creating a digital 3D model of the building from a laser scan to account for the architectural features of theMART and to determine the projector configuration. Obscura also developed a content management solution to provide show control, and to allow theMART curatorial team to easily upload and render/resolve the projection mapping content. This included masking the windows with special software so the projectors wouldn’t shine light into the building interior. To house the 34 Christie Boxer projectors, Obscura worked with Vornado and architectural firm Valerio Dewalt Train Associates (VDTA) to design a custom enclosure located across the Chicago River. “The projectors are housed in an architecturally integrated custom enclosure with a glass curtain wall and all the required mechanical and electrical systems,” said Nathan Houchin, senior technical producer, Obscura Digital. The enclosure protects the projectors from the elements, as the show is scheduled to run from March to December, five nights a week (Wednesday – Sunday). The main channels have 16 projectors each, stacked to increase brightness, with the centre channel, covering the centre tower, having two projectors stacked. All are blended together to create one seamless image. With such a demanding show schedule, Obscura knew that they needed high-brightness, reliable projectors capable of managing not only the giant façade, but also the ambient light from street lights, traffic, other buildings, and light reflecting off the Chicago River itself. After performing projector tests, the Christie Boxer 4K30 projectors were the clear and cost effective choice, noted Chase. Diana Thater, Zheng Chongbin, Jason Salavon and Jan Tichy – all renowned contemporary artists − were commissioned to create work for the inaugural programme, which launched on September 29 and will remain on view through December. Art on theMART selected and commissioned the work by Thater and Chongbin, while Salavon and Tichy were commissioned by the Terra Foundation for American Art and confirmed by an esteemed Curatorial Advisory Board comprised of several of the Chicago’s most distinguished arts and culture leaders.